For those of you who haven’t seen any pictures yet, here is a pic. of my family and I on my vestition day. More pictures will be coming soon. With the Labor Day weekend upon us, we have had plenty of activities to keep us novices occupied. This last week we started our classes here at the House of Studies. We are taking a Spanish class to reintroduce us to Spanish, something undoubtedly important for our future as ministers in the Church (especially serving in the Diocese of Green Bay and Archdiocese of Santa Fe). Right now we are focusing on basic pronunciation. Hopefully I catch on quickly. We’ve also begun a class designed to give us insight into religious life. We are reading a book on prayer (written by fellow Norbertine, Fr. Alfred McBride), an illustrated ‘guide’ to the contemplative life, the Book of Customs of St. Norbert Abbey, and finally a book called “Letters Written in Good Faith”. The latter book I’m finding completely enthralling! It’s a collection of roughly 400 letters written by Abbot Pennings and his two counterparts (Fr. Lambert Broens and Br. Servatius) back to their home abbey at Berne, Holland and also to family and friends. It is wonderful to be reading the day to day life that was written by hand almost 120 years ago! Abbot Pennings and the two men were sent to the Green Bay Diocese at the request of the then Bishop Sebastian Messmer. They came over by boat and eventually ended up in Door County only to permanently settle in De Pere, starting what would become St. Norbert Abbey. 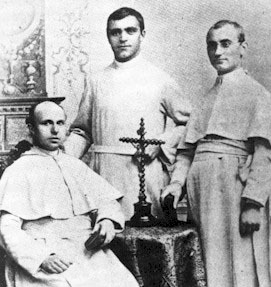 (The three missionaries from Berne Abbey to Sturgeon Bay, WI in 1893. My first day of cooking was on Thursday. I think it went over well. I must say, I’m a better cook than I imagined. Hopefully that streak continues. I made tater tot casserole, garlic butter crescent rolls (yes, they were pre-made), a salad and a yogurt parfait for dessert. Everyone seemed to enjoy it, which made me happy. On Saturday, we took a mini field trip out to the ‘burbs’ to see a beautifully decorated Byzantine Catholic Church. The pastor is a master of iconography and taught some of his parishioners the art, and together they hand painted the entire sanctuary space in beautiful iconography! I had wished I brought a camera to take pictures! It sounds like we will be attending a Liturgy there one Sunday, so maybe I can find a camera to bring with me. On the way home from the Byzantine Church, we stopped at a beautiful park in the middle of a cluster of Illinois Forest Preserves to have the first of our monthly meetings with Fr. David. We each took a half hour to discuss things about Novitiate and our own opportunities of growth in the Order. When we weren’t meeting with Fr. David, the other pair got a chance to walk around the park and explore what it had to offer, as well as get to know one another better. The other two men in my class are very interesting! More on them in later posts, perhaps. 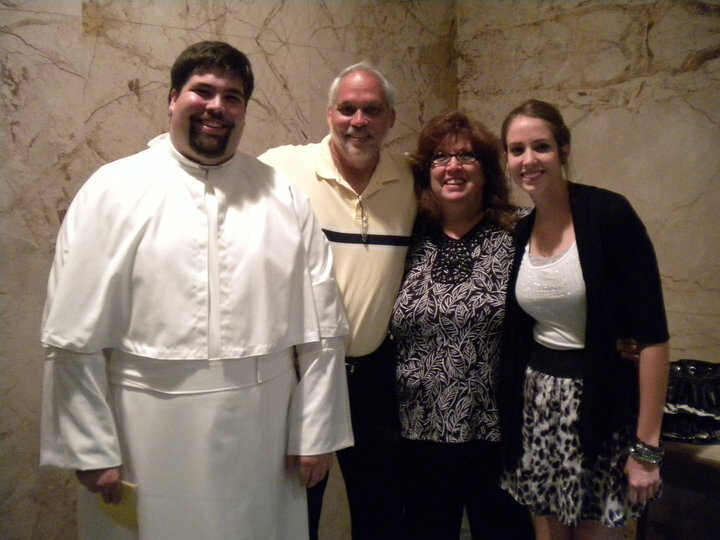 On Sunday, we headed off to Mass. Usually, St. Clement, a beautiful church in the Lincoln Park neighborhood, is our ‘default’ church, but every other week or so, we take the opportunity that the city has to offer us: a large and very diverse offering of Catholic churches. We attend these Churches and then discuss our opinions during our Monday class. This weekend we wanted to go to St. Benedict the African East Church. It is a Black-Catholic Church that is architecturally designed like a hut in Africa, complete with trees and dirt floors, plus a HUGE baptismal font that resembles a small lake. However, when we arrived, we found out that Mass times have changed from what was published, so we will have to return to Mass there again. Instead we went to St. Ailbe’s Church on the South side of the city. Again, primarily a Black Catholic parish and school, it was ‘rockin’ to say the least! Folks from Our Lady of Lourdes may recognize the name because Fr. Tim served as deacon there for some time. The stories he told me about that parish are very true. It is a very, very welcoming community. The music (a wonderful gospel choir and organist) provided an upbeat and energetic ambiance to the Liturgy. The pastor, who is Caucasian, does a great job of ministering to the people he serves. Mass lasted an hour and 45 mins, but I really didn’t notice the time as there was something that always grabbed my attention. It was quite a different experience, for sure! The one thing that I am still in amazement over is the great faith of the people of Chicago. Life seemed so busy in De Pere which sometimes made it hard to settle ourselves down for Mass once a week. I only assumed it would be worse here in the big city. So far, every Mass I’ve been to, Chicagoans are always participating, always singing all the verses to every song (including the recessional hymn) and always welcoming. I’ve been proven wrong in my thoughts about worshipping God in a Metropolitan area! It is a wonderful surprise. Well, that’s about all that has happened here in this first week. Tomorrow, we are grilling out for the holiday and then it’s back to the books! Let’s keep praying for each other, ok? Sts. Ailbe and Norbert, Pray for us! Sounds like you had a great first week! I have to admit that De Pere has been awfully lonely since your departure. Not only do I no longer have anyone to discuss the finer points of the religious differences between our two faiths with, but I also miss the meals too! lol. I am glad that you enjoyed your first week as a novitiate, and that you are adjusting well. I do have to admit though that a slight crease of disappointment appeared in my forehead when I was reading about the “upbeat and energetic” churches you have been visiting. We shall have to talk about those sometime. lol. I can’t wait to hear all about your experiences. God’s richest blessings to you on your continuing journey!